Catering to the requirement of industrial establishment, we are engaged in the manufacturing and export of Sheet Metal Racks. Available in gray hammer tone finish, the rack has open frame design to enable easy access to equipment and cabling. 19 rack mountable sub – rack 4u made out of aluminium extrusions card guides duly powder coated & screen printed. 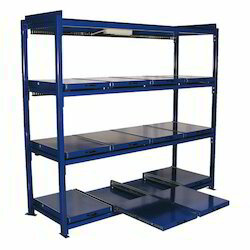 We are offering Sheet Storage Rack to our clients. To cater the variegated demands of our clients, we are highly engrossed in manufacturing and trading a wide range of Sheet Metal Rack. Available Color: Blue, Red, Black etc. We are offering Sheet Metal Racks to our client. Size (length x Width): 48" X 1.5"
this type sheet metal storage racks easy handling raw materials trolley type pallet push and pull moving smooth . easy install and remove able type travel. wendor liked this any color power coating finished. 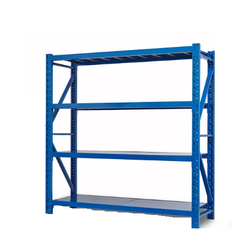 Having a definite quality management system, we are immersed in bringing forth a top class consignment of Storage Rack.